Woohoo another good day of progress! I was able to hand mount, install, and air up my new tires on my restored wheels. No major issues getting them mounted. A bit of touch up paint where the tire iron damaged the backside of the rim. That's why I mounted them face down. My process basically was to put the wheel on a moving blanket face down. I then put a plastic trash bag over the wheel and lubed up the tire with some windex. I got the first bead over the edge of the wheel and then using the tire iron got the second one to go as well. I tried to minimize the impact the tire iron had by using some extra plastic to cushion it but couldn't get everything. If I did it again I'd probably put some tape on the tire iron too. I touched up the paint, installed my wheel balancing Dynabeads, put a ratchet strap around the entire circumference of the tire, and aired them up! The Dynabeads are like wheels weights except it is a dynamic balance, this little small beads rotate inside the tire finding the low spot and balancing the tire, even as it wears! Really cool. Here's a video of how the Dynabeads work. I could have done normal balancing, but the wheel has such a wide opening most places can't do it. The trick is to bring in a used brake drum and balance the wheel with the brake drum attached, but the Dynabeads are so much better! 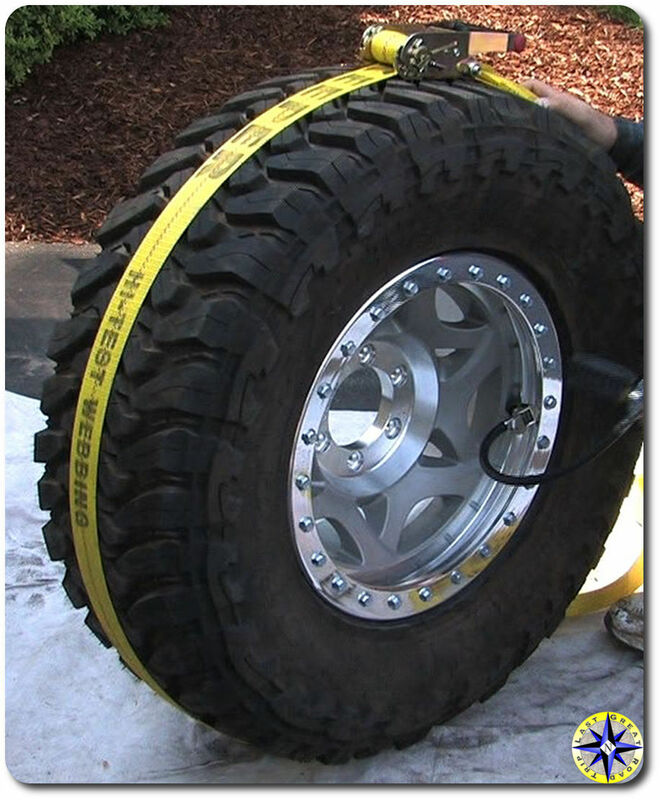 The ratchet strap around the tire was necessary to compress it so the bead would seat against the rim. Worked like a charm. I'm really happy with the look of the tire, the fit, and how well they installed. A couple hiccups but glad to say I did it myself and my bare hands! Next up, priming the body parts! Wheels are done! They came out great and I'm happy with the results. I also did the acid etch on the two replacement windshields I got and it turned out great. Already sold one for $175 and hoping to get $200 for the other. Next up primer on the body parts. Today I did the L87 Pearl White paint on the inner discs of the wheels. Overall, it turned out pretty good. I was happy with them, they needed a bit of work with a razor blade after they had dried but very presentable. I even managed to nick and and repair a wheel already. First scratch done! I had a good helper too! I am working to get the vent window logo also put into a stencil. 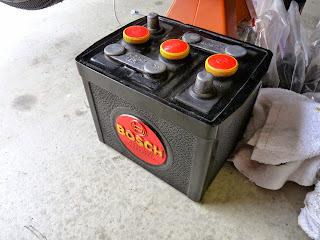 And I also picked up and installed the battery logo on my reproduction battery. This would have been the original logo that went on the battery. Yes, this is how crazy I am being considering this thing will be underneath the rear seat for approximately no one to see. Next step is the mask off the last part of the wheels and spray those Moss Green. It's a dark forest green type color. I still have a couple black parts to paint later on, and all of the Stone Beige pieces for the inside. I have to wait until I get the steering wheel back before I can do those, however. So, really after the wheels I'll move onto priming the body parts and getting ready for block sanding. Well another good day of progress today. I finished the headlights last night, which came out really really nice. Of course I had to take a funny picture too! I was able to finish all the black painted objects (well almost all of them) today. They came out great and I covered up some of the areas I missed on the first run. And what I'm most proud of today is the windshield etching with the VW logo. I ended up taping it off and doing glass bead blasting instead of the acid etch cream. It turned out GREAT! It looks exactly like factory on a brand new windshield. It's perfect! Next step is to tape off the wheels for the 2 color coats on the front. Slowly but surely! I got most of my black parts taken care of. They look pretty good. I have to do the "other side" on many of the parts so I'll probably do another painting day tomorrow. I also missed a few areas on the wheels so I'll do some touch up there. Yesterday I was able to get a couple things done. I picked up the vinyl stickers for the windshield etching. I think I'm going to try sandblasting instead, that's what they do and have better results. I have the same company working on the ones for the vent windows. We'll see what they come up with. I also got some of the original battery stickers ordered from a local sign shop. They were pretty pricey, but I should be able to sell the extras I had made to recoup most of my cost. So, more painting tomorrow in black! After that I'll finish the fronts of the wheels in the two other colors and be able to mount the tires. I also have a rainy/windy day project of putting together my headlight assemblies as they are ready now that the black is all done. I am waiting on my steering wheel before I spray the Ivory parts. And I do have some more parts in transit to be painted black but can mix a small batch for that! Well I had yet another two trips to SoCal and was able to get some things sorted. First, I went and returned 3 of my white walls to get some that had a wider white. Now they are all within about 1/8" of each other so I'm much happier. Just need to get the wheels painted! Then yesterday I was able to meet up with a super cool dude who had a very nice 61 ragtop but he restored himself over the course of 5 years. Crazy thing was....he was 21! Very impressive as he did a great job, took pride in his work, and had a great head on his shoulders. He had original bumpers on his car that were in almost perfect chrome. They have a couple nicks and issues that need work, so I will likely get them rechromed but they are ORIGINAL GERMAN!!! It is very hard to find these, in such good shape, and even at a reasonable price. Thanks Tyler! Used the crew car to transport the bumpers. Another bug part in the cargo hold! How sweet are these? Came with the brackets too, I'll reuse my original ones. Hard to see but one little dent here. Chrome peeling on the top of the blade. This is why these are so sought after! Truth is, I could probably run them as is. But with the rest of the car being all redone I would feel a bit silly. We'll see when it comes down to crunch time. Anyway, this has been an expensive week with the tires, Wolfsburg West parts run, and the bumpers. I have my steering wheel restoration to pay for and also the small chrome pieces. So I'm looking at another hefty credit card bill. Time to pick up some extra work! I am working on some smaller projects too. I got my original windshield logo made into a vinyl stencil which I am picking up today. Should be able to etch glass using it. I am also going to have one made for the reproduction vent windows. And finally I'm also working on a battery sticker for the original style battery I bought at Wolfsburg West. 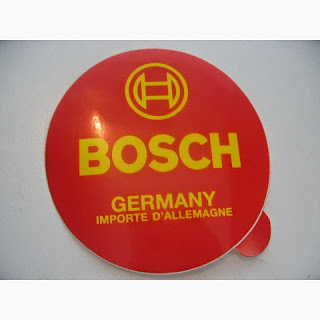 It's a Bosch logo and looks like this. Quite a bit of progress the past couple days. First, yesterday in between flights at work I was able to make 3 stops in southern California and get some parts hunting done. First stop was to get chrome work quoted which was good, albeit a bit high. I am sending the parts out to Montana to see if I can get a better deal and better work. Once I hear back I'll make a decision where to send the parts. I also stopped and purchased a bunch of parts at my favorite vendor Wolfsburg West. I got vent windows, headlight trim rings, all the light bulbs for the car, some random odds and ends, even an original style battery. I stopped at a local vendor for vintage classic tires and this place was so cool! The walls all had signs from old gas stations and the entire place was filled to the rafters with vintage tires. Bias ply, white walls, hard to find, no longer made type stuff. Very cool! I was going to purchase 5 bias ply wide white walls seen below but found it was actually cheaper (no sales tax) to have them shipped to the house. Well, I recieved the tires today and had two concerns. First they weren't 3" exactly as advertised. A little bit smaller BUT the real kicker is I had 3 tires from one production run and 2 tires from another. What this meant is there were differences between the two sets. And of course, that is going to drive me crazy. So I "saved" money by having them shipped and now have an errand to exchange some for the matching ones. A pain, but worth it in the end. These are the 2 3/4" stickered ones...which are larger of the two, but still smaller than 3"
Today I also disassembled an original 36hp fuel pump I got for $20. I bought a new diaphragm for it yesterday at Wolfsburg West so for about $40 and some elbow grease I'll have a nicely restored fuel pump. I may keep this one or I may sell it off again for a profit. I organized the parts I got yesterday and taped off the wheels for the black paint on the inside of the rim and back side. Not sure when I'll be able to paint next, but they're ready! Well today I got some more work done. Small stuff but good stuff! First, I finished off the gas tank and some minor touch ups on the other blue gray parts. They all turned out very nice. I'm very happy with the results! I also prepped all the parts I primered a few days ago. They had a couple runs and I also needed to make sure they had some "tooth" for the next coat of paint. The next thing up is the wheels, which are green, white, and black on the back. And finally, Caroline and I finished the glove boxes and they really turned out nice! I hope to sell the other one and make some money for some more parts! Outside all finished, applying the dyed glue. The tube on the bottom is the device used to apply the fine fibers. We had to sift the fibers as they tend to bunch up into little balls. This was the 2nd glove box, the one from my car. I taped around the edges to avoid drips. Next time I hope to do some more paint! More painting today! Caroline's return flight home got delayed a few hours which was the perfect amount of time for me to get some things painted and drying while I picked her up at the airport. The color was VW L29 Blue Gray and it is more or less the VW stock color for primered objects. The big one here was the gas tank. I ended up painting the bottom with the top part masked off. I'll do the reverse next time. There are also some odds and ends like the arm rest support bar, heater muffler covers under the rear seat, and a piece under the hood that supports the flasher. The wiring cover and trunk liner are also Blue Gray in this particular year. Anyway, I'm very happy with the progress and the results. The color turned out GREAT and the painting skill was very good. No problems with the gun and excellent coverage on the paint with no runs! I am going to flock the glove boxes and then move onto the wheels painting the inner disc first and then the outer for that classic two tone look!